Mario R. Capecchi, distinguished professor of human genetics and biology at the University of Utah’s Eccles Institute of Human Genetics, is one of a trio of researchers who were awarded the 2007 Nobel Prize in Physiology or Medicine. 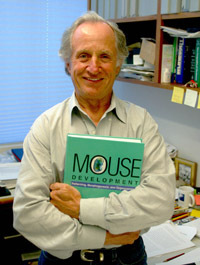 The prize recognizes Capecchi’s pioneering development of “knockout mice” technology, a gene-targeting technique that has allowed the creation of animal models for hundreds of human diseases, including the modeling of cancers in the mouse. The Nobel tops a long list of honors for Capecchi, who, as a child, was forced to wander the streets of Italy after the Nazis took his mother to a concentration camp. Among other recognitions, he has received the Medal of Science, America’s highest award for lifetime achievement in scientific research. Knockout technology makes possible detailed evaluation of the function of every mouse gene at any stage of development or in the adult. The technology not only has made possible the production of animal models for human disease, but it also is providing researchers with insights into understanding fundamental biological questions, including development of the brain in the embryo or its function in the adult. Capecchi was born in 1937 in Verona, Italy, of an American mother, Lucy Ramberg, who did not marry Capecchi’s father, an officer in the Italian air force. Capecchi’s earliest memories are of the Nazis taking away his mother, a poet who had aligned herself with anti-Fascist intellectuals. Before leaving for the Dachau concentration camp, she sent her son to live with a poor family of farmers, giving them funds for his support. But the money ran out and he was forced to live on the streets for four years.